Sam was told he would never be employable. But a chance connection at a camp proved those early assumptions wrong. Sam, 17, has autism and immediately stood out to Chris, who would be his future manager at Starbucks. “He told me one of his dreams was that he wanted to be a barista and I tried to make that happen,” Chris told Ellen DeGeneres on her talk show. Sam thought he was coming into the Toronto store for a formal interview, but Chris told him he already got the job. “In that moment my life changed – my whole world changed,” Sam said. While he makes customers’ drinks, Sam dances behind the counter to help control his movement disorder and focus on his work. A video of his dance moves went viral and was viewed more than 66 million times. Chris told Ellen he’s seen Sam become more outgoing and be able to work independently since he started at Starbucks. And Sam credits Chris giving him a chance when others wouldn’t. “He’s an amazing boss, and he’s also a really, really good friend and I wouldn’t give him up for anything” Sam said. “If it takes an able-bodied person 30 steps to get to his dream and it takes me 90, I’m still going to get there just as fast as they’re going to get to their dream,” says Chef Aleem Syed. One of those steps is being the proud owner of the first fully wheelchair accessible food truck in North America and, likely, the world. 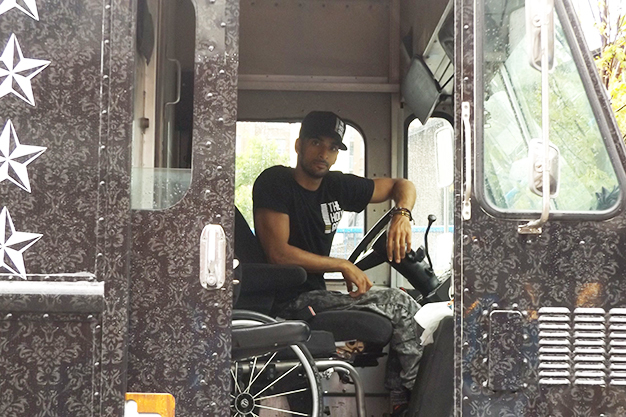 Chef Aleem Syed in his food truck. The Holy Grill (named for that future restaurant) features a ramp coming out from under the back door and a wider passage, allowing the 33-year-old chef to turn his wheelchair 360 degrees. The truck has lower surfaces for easier access and space for his chair next to the driver’s seat. You can read more about Syed in NOW Toronto. For years, James Gower followed the advice of career advisers who told him to hide his disability on job applications. He thought disclosing his disability was akin to pointing out his weaknesses. By not disclosing his disability, Gower, who has cerebral palsy, was hiding his true self. And eventually he realized the advice he was following for years was wrong. “It quickly became apparent that the sooner I was open about my disability, the sooner the employer could consider reasonable adjustments and see past my potential disadvantages,” he wrote. You can read James Gower’s entire article here. 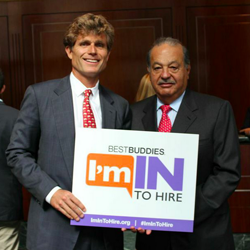 Last fall, Carlos Slim and Anthony Shriver announced a new campaign aimed at getting more businesses to hire people with intellectual and developmental disabilities. Founded by Best Buddies International, “I’m In To Hire” aims to unify the voices of employers and employees alike in support of hiring people with developmental disabilities. Read more about the campaign here and take the #ImInToHire pledge. This is a wonderful idea from Canada for how to find creative ways to host employment training for people with disabilities. Common Ground Cooperative is a local non-profit that provides social enterprise and empowered employment opportunities to people with developmental disabilities. One of the participants is The Coffee Shed – a coffee shop run by adults with developmental disabilities headquartered in Surrey Place Centre near Queen’s Park. Last month, The Coffee Shed launched an Indiegogo campaign to fund a barista training program inside their premises. Called Made by Mavericks, the training program was created by Gerald Patrick Fantone, a job coach at Common Ground. Read the rest of the story from Now Toronto.